The Compliance Jobs Report this week has CCOs hired or promoted at Broward Health, Encore Capital, Allergan, Slalom, Bollore, and many more. 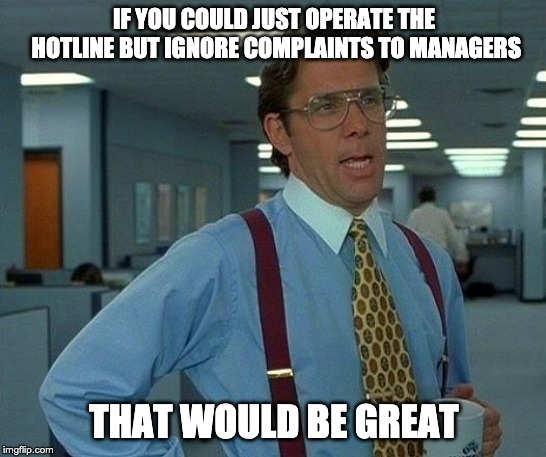 The head auditor at Citi has taken an operations role; lots of vendor gossip this week too, and our Meme of the Week goes out to all the hotline managers. Broward Health, the troubled healthcare organization based in Fort Lauderdale, Fla., has named Brian Kozik chief compliance officer. Kozik comes to Broward Health from Lawrence General Hospital in Lawrence, Mass., where he was also chief compliance officer. He joins Broward Health’s new CEO, Gino Santorio, who is trying to put the organization on firmer footing after several years of management turnover and accusations of financial mismanagement. Reshuffling at Citigroup: chief auditor Mary McNiff is moving up to be head of Citibank NA, and will head the bank’s business practices committee. McNiff had been chief auditor at Citi since 2017. Her job will be filled by Jessica Roos, currently chief auditor of Citi’s investment bank. Roos has been with Citi since 2014. Oh, look: Jeb Hensarling, former Texas congressman and head of the House Financial Services Committee until he retired last year, is joining Swiss bank UBS as vice chairman for its Americas region. Rather poetic that such a devout anti-regulation, America first Trump supporter now works for a Swiss bank. Slalom, a consulting firm based in Seattle, has reassigned Mel Murphy to policy and compliance program manager for human resources. Murphy had been compliance program manager in the information security function for the past year. In Chicago, Aaron Marshall has a new job: he’s compliance manager at AbbVie. Marshall was previously at Lundbeck as manager of compliance programs for North America. Andrew Schillinger has left his job as director of compliance for Providence St. Joseph Health in Spokane, Wash., to take a job with the state of Washington as an assistant attorney general. Schillinger had been working with Providence in various compliance roles since 2017. Allergan has promoted Ornella Izzo from legal and compliance manager to associate director of legal and compliance. Izzo works for Allergan from Rome, and has been with the pharma company since 2012. GreenSky, a financial services firm based in Atlanta, has promoted Brian Madonia to senior vice president of internal audit. Madonia has been with GreenSky for 14 months. Quentin Chevalier has a new role at Bollore, the French investment management firm, as compliance manager at the company’s main office in Paris. Chevalier had worked for Bollore’s transportation and logistics subsidiary as a compliance officer since 2010. Encore Capital Group, a financial firm that is the largest buyer of distressed debt in the United States, has re-assigned Doris Hektor from chief compliance officer to chief risk officer. Hektor will oversee the firm’s enterprise risk management function, and report to the board of directors. She has been at Encore since 2014. Encore also just promoted Addison Crawford to be chief risk and compliance officer for Midland Capital Management, Encore’s largest U.S. subsidiary. Crawford has been with Encore since 2015. R.J. O’Brien & Associates, a futures brokerage and clearing firm in Chicago, has promoted Kathleen Clapper from director of compliance to chief compliance officer. Clapper has been with RJO since February 2018 and replaces Nancy Westwick, who is retiring. Element Pointe Advisors, a wealth management and family office advisory firm based in Miami, has hired Heath Wruble as chief compliance officer. Wruble comes to Element Pointe from Kestra Financial, a broker-dealer and investment advisory firm. Andrew Jacobs has been named chief compliance officer at Avangrid Networks, a power utility in the Northeast. Jacobs previously worked as assistant general counsel for compliance at XL Catlin, an insurance firm. News from the standard-setting world: the Sustainability Accounting Standards Board recently named Madelyn Antoncic its new chief executive officer. Antoncic comes to SASB from the World Bank, where she held various roles since 2011. And good news if your job is to worry about wage-and-hour compliance: the Senate has confirmed Cheryl Stanton to be director of the Labor Department’s Wage and Hour Division, on a 53-45 vote. Stanton comes to Washington from South Carolina, where she was head of that state’s employment agency. David Griffith is celebrating one year at Citigroup, where he is vice president for regulatory exam management. Felipe Harman is celebrating one year as Rutas de Lima SAC, a construction firm in Peru. Mary Shirley just hit her four-year anniversary at Fresenius Healthcare. She is currently senior director of ethics & compliance at Fresenius North America. We also note the passing of Dimitri Vlassis, former chief of the Corruption & Economic Crime Branch at the United Nations Office on Drugs and Crime. Vlassis was a long-time voice on anti-corruption, and we extend sympathies to his loved ones. You know those two whistleblowers who exposed Theranos as a gigantic fraud, Erika Cheung and Tyler Shultz? They are forming a nonprofit, Ethics in Entrepreneurship, aiming to get Silicon Valley startups to embrace ethical business practices more fully. Good for them. Ethisphere just named a new chief product officer, Charlie Vanek. Vanek comes to Ethisphere after stints in product development at Blackbaud, Thomson Reuters, and MicroEdge. Strategic partnership: LogicManager, a maker of ERM software, has cut a deal to offer Compliance.ai’s change management tool to its customers. Congratulations to the Great Women in Compliance podcast, which is so successful it is scaling up to weekly episodes. GWIC is hosted by Mary Shirley of Fresenius Healthcare and Lisa Fine, whose new job currently remains secret. The Center for Audit Quality, which objects to being called a lobbying voice for the audit industry but nevertheless represents audit firms in public policy debates, has named Julie Bell Lindsay as its new executive director. Lindsay comes to the CAQ from Citigroup, where she was managing director and deputy head for global regulatory affairs; others may remember Lindsay when she was a senior counsel at the Securities & Exchange Commission back in the 2000s. She succeeds Cynthia Fornelli, who retired earlier this year. Western Union is looking for a director of global anti-corruption strategy. Job is based in Denver. Providence Health is recruiting an executive director of compliance. Job is based in Burbank, Calif.
And Unisys, government contractor, is looking for a chief compliance and privacy officer (who will report to the general counsel, so phooey on that part). Job is based in Reston, Va.
That’s all for the week ending April 12. As always — if you have a tip or want to brag about your new job, promotion, career milestone, or anything else, email me at [email protected] or find me on LinkedIn. I’m always happy to give credit to the many hard-working people here in our corner of the business universe.